Phil Rizzutto « It's a Kind of a Family. It's a Kind of Insanity. Is Curt Schilling a Hall of Famer? When I first heard that Schill would be out for the season because of shoulder surgery, I felt a cold shiver go down my spine. Deep down, I was expecting him to return just in time for the playoffs and play a key role – even if it meant pitching one important inning in the ALCS. 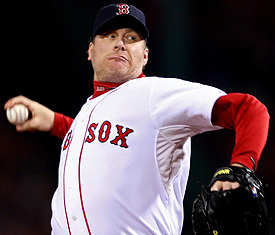 Curt Schilling in the postseason is like Michael Jordan in the Finals and Tiger Woods in the Majors. Think that’s an exaggeration? Check the stats (or just trust me, he’s MONEY when the games are big — even when his body is broken). The Bert Blyleven Argument: Several writers and commentators have pointed to Bert Blyleven’s failure to garner 75% of the vote, reasoning that since Blyleven isn’t in the Hall, Schilling shouldn’t be in the Hall either. But an in-depth look at Blyleven’s career makes it clear that he, too, belongs in the Hall of Fame and that the sportswriters who vote have really blown it by not electing Blyleven. Only Nolan Ryan, Steve Carlton, Randy Johnson, and Roger Clemens have more career strikeouts, and when he retired, Blyleven was third all-time in this category. All-time! Can you imagine if the guy who’s #5 in career hits wasn’t in the Hall yet? (That’s former Red Sox star outfielder, Tris Speaker, with 3,514 hits). It would devalue the Hall to leave out Tris Speaker (who, like Schilling won three World Series, two of them with the Red Sox). Blyleven’s also top-ten all-time in career starts, and his 60 career shutouts rank 9th on the all-time list. Every other pitcher among the top-20 in shutouts is in the Hall. Why not Blyleven? Beats me. He’s 13th all-time in innings pitched (4,970) and all twelve of the pitchers ahead of him in this category are enshrined in the Hall of Fame, as well. And while he didn’t have 300 career wins (which seems to provide a ticket to the Hall), he came damn close with 287. Plus, Blyleven was excellent in the postseason too — in three postseasons, he was 5-1 with an E.R.A. of 2.47, and his teams won the World Series TWICE. Both Blyleven AND Schilling belong in the Hall of Fame. So let’s stop using Blyleven as a barrier to Schilling. And anyway, it’s just as easy to find players whose inclusion in the Hall of Fame support Schilling’s case — Phil Rizzutto (in 13 seasons, his lifetime B.A. was .273, but he won 7 World Series with the Yankees), Ozzie Smith (.262 lifetime B.A. and 94th all-time with 2,460 hits, but won 13 Gold Gloves and played in 3 World Series, winning one of them); Tony Perez (in 23 years his lifetime B.A. was .279 and he had 2,732 hits, which places his 50th on the all-time list; but his real claim to fame is that he played in five World Series and won two of them as an integral member of the Big Red Machine). I believe that all three of these guys belong in the Hall of Fame, but none of them has a case that’s stronger than Curt Schilling’s. I know, those are hitters and you want to compare Schilling’s career to other pitchers who are in the Hall, right? OK. Here are four great comparisons: Hal Newhouser, Jim Bunning, Don Drysdale, and Catfish Hunter. Hal Newhouser won only 207 games in his 17-season career (with an E.R.A. of 3.06), but during the seven year span of 1944 to 1950, he was dominant, going 151-80. 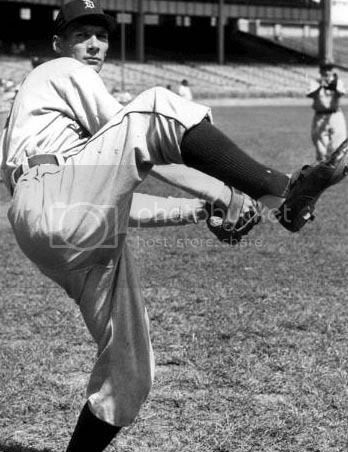 He won the MVP award in 1944 and 1945 (the only pitcher in history to win the award in consecutive years), and he was second in MVP voting in 1946 (this was before the dawning of the Cy Young Award, in 1956). For his career, Newhouser pitched 212 complete games, and during his dominant seven years, he completed 136 of the 240 games he started (57%). Newhouser pitched in two World Series, winning one of them, but his performance wasn’t Newhouser-esque — he went 2-1 with an E.R.A. of 6.53 in 20.2 innings. 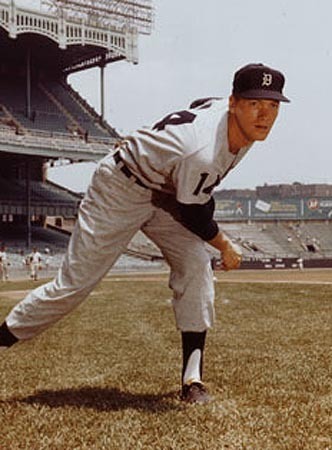 And during his long career with the Tigers, he had a winning record in only seven of his 17 seasons. Take away those seven winning years, and his record during the other ten seasons was a mediocre 56-70. Still, all baseball historians know that Hal Newhouser belongs in the Hall of Fame. And if Newhouser’s a Hall of Famer, then so is Curt Schilling. Jim Bunning was 224-184 with an E.R.A. of 3.27 during his 17-year career. He won 20 games only once, never won a Cy Young Award (though he did place second in the voting once), and he never pitched in the postseason. He did play on nine all-star teams, and he led the league in strikeouts three times (he’s 17th on the all-time K list with 2,855, which is 261 less than Schilling, who is 14th on the career list with 3,116, one shy of Bob Gibson’s 3,117). Jim Bunning belongs in the Hall of Fame, but his stats reveal that he was a lot like Curt Schilling – without the rings. So if Bunning’s a Hall of Famer, then so is Curt Schilling. Don Drysdale was 209-166 during his 14-year career. He won 20 games twice, won the Cy Young Award once, and like Schilling, played in five postseasons, winning the World Series three of those times (he, too, was a winner). During his five World Series, Drysdale was 3-3 with an E.R.A. that mirrored his career E.R.A. of 2.95. He played on eight all-star teams and led the league in strikeouts three times (his 2,486 career strikeouts place him 30th all-time). Drysdale’s career was relatively short, so his career numbers don’t rank him among the all-time leaders in any category. But he was GREAT during the period he did play, and he played a major role on THREE World Series-winning teams. Does Don Drysdale belong in the Hall of Fame? Yes. And his inclusion means Schilling belongs in the Hall, as well. Jim “Catfish” Hunter was the ace pitcher of the A’s dynasty, compiling a career won-lost record of 224-166, with an E.R.A. of 3.26 in fifteen seasons. His 2,012 strikeouts place him 60th on the all-time list. He won 20 games five times (in consecutive years, 1971-1975), was an all-star eight times, and he pitched in SIX World Series, winning FIVE of them (three as a member of the A’s, and two as a Yankee). His World Series record was 5-3, with an E.R.A. of 3.29, and his overall postseason stats are 9-6, 3.26. Hunter won one Cy Young Award and placed second in the voting once, third once, and fourth once. He pitched one of only 15 9-inning perfect games (ever, including Don Larsen’s WS perfect game) on May 8, 1968. And even with fellow Hall of Famers Rollie Fingers and Goose Gossage as his team’s closers, Hunter still completed 181 games, or 38% of the games he started. Schilling’s Hall of Fame case is very similar to Hunter’s — their collection of World Series rings and their individual impact on these teams lead their resumes, and when their career stats are added to their postseason success, you just can’t keep them out of the Hall. The “He Was Never a Dominant Pitcher of his Era” Argument: This is the most frustrating argument of all, because Schilling has been a dominant pitcher during his era. True, he has never won a Cy Young Award, but he has placed second in the voting three times (in 2004 he placed second behind Johan Santana, and in 2002 and 2001 he placed second behind future Hall of Famer Randy Johnson. In 1997, he placed fourth in the voting behind Pedro Martinez of the Expos, Greg Maddux, and Denny Neagle). Schilling has been selected to six All-Star Teams (1997, 1998, 1999, 2001, 2002, 2004) and has had three 20-win seasons (2001, 2002, 2004). His career ERA of 3.46 is better than that of Tom Glavine (3.53, and Hall-worthy), Roy Halladay (3.58, and on-track for the Hall), and Josh Beckett (3.75, and on-track for the Hall). He’s 13th all-time in strikeouts (one behind Bob Gibson) and his strikeout to walk ratio (4.38) is the lowest of any pitcher since 1900! And, of course, Schilling is one of the most dominant pitchers in postseason history… more about that below. The “216 Wins Isn’t Enough” Argument: Now I understand this argument, and taken all by itself, it does have some merit. Schilling is 79th all-time in wins, and there are 30 pitchers with more wins who are Hall-eligible and have not gained enshrinement. These include Tommy John (288), Bert Blyleven (287), Jim Kaat (283), Jack Morris (254), Frank Tanana (240), Luis Tiant (229), Jerry Koosman (222), Joe Niekro (221), and Mickey Lolich (217). There are several active pitchers who are in the same zone as Schilling: Jamie Moyer (237), Kenny Rogers (215), Pedro Martinez (211, and Hall-worthy), John Smoltz (210, and Hall-worthy), Andy Pettitte (209). Like I said, if career wins was the sole indicator of Hall worthiness, Schilling probably wouldn’t make it. But it surprises me when writers say, “He needs one more 15-win season to make it,” or, “Forty more wins, and he’d have my vote.” Why does this surprise me? Because I would expect educated sportswriters and historians of the game to understand that two more 15-win seasons wouldn’t change the monumental impact of Schilling’s career. Yes, they would help him compare more favorably with other greats on a list of career statistics, but that’s all. All the things that make Schilling a Hall of Famer have already occurred in his career. Anything he does from now until he retires is just stat-piling (unless, of course, he wins another World Series — which is possible). Some guys are in the Hall because their longevity and consistency helped them amass amazing career stats. And some guys are in the Hall because of the undeniable impact of their careers on Major League Baseball (Newhouser, Drysdale, and Hunter are the best examples among pitchers). If Schilling heals and pitches a couple more seasons, he’ll rise in the “longevity” category, but he’s already an elite force in the “impact” category. The Greatness Factor: The evidence that pushes Schilling into Hall of Fame territory is the key role he played on three World Series-winning teams. THREE. It’s not an exaggeration to say that, without Schilling on those three rosters (2001 Diamondbacks, 2004 Red Sox, 2007 Red Sox), NONE of those teams would have won it all. We all know about his clutch performance in the “bloody sock” game – the critical sixth game of the ALCS in Yankee Stadium, when he pitched with fresh sutures holding together his ankle. 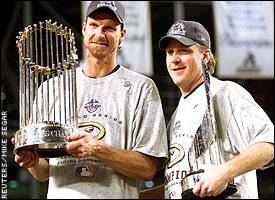 But let’s not forget that Schilling was the co-MVP of the 2001 World Series (as a Diamondback), in which he pitched 21.1 innings, striking out 26 Yankees and walking only two. His World Series E.R.A. that year was 1.69. All in all, during the 2001 postseason, Schilling was 4-0 with a 1.12 E.R.A., and he had 56 strikeouts and 6 walks in 48.1 innings. “So that’s only one postseason,” you say. “Lots of guys get hot in one postseason. That doesn’t make you a Hall of Famer.” Fine. So let’s look at Schilling’s performance on the 2004 and 2007 World Championship Red Sox teams. During these two postseasons combined, Schilling went 6-1 with an E.R.A. of 3.20. 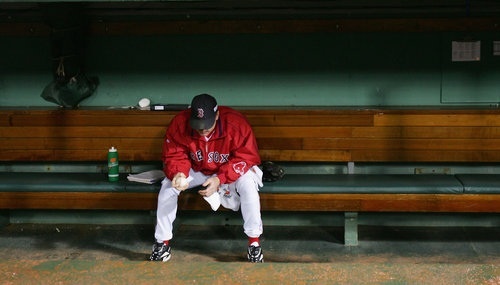 He won the critical sixth game of BOTH ALCS series (2004 vs. Yanks, 2007 vs. Indians) with the Sox facing elimination, and in BOTH games he won with heart more than velocity. In the 2004 and 2007 World Series combined, Schilling started two games (remember, both series were four-game sweeps) and went 2-0 with an E.R.A. of 0.79. In total, Schilling’s postseason record is 11-2 with an E.R.A. of 2.23. He played in the postseason five times, and his team won the World Series in three of those appearances (amazing, given that in the Wild Card era, each playoff team should have a one-in-eight chance of winning it all). Curt Schilling is one of the greatest “winners” in the history of Major League Baseball. Sure, he won less than half as many regular season games as Cy Young won (512), but he’s among the elite in terms of winning BIG games. And when it comes right down to it, isn’t winning BIG games what it’s all about? Isn’t winning the World Series what it’s all about? Pitching greatness has several forms, and not all of them include 300 career wins. Hall of Fame members would be diminished by the omission of Curt Schilling. Not everyone loves the guy’s schtick (personally, I love his honesty and his determination to be himself), but no one can deny that he pitched his guts out every start, that he was among the most prepared and cerebral pitchers in the game’s history (who else returns to the dugout and immediately takes notes on the inning he just pitched?) and that he was one of the all-time greats when the pressure was most intense and the stakes were highest. So, baseball writers, do your job and cast a Hall of Fame vote for Curt Schilling. And while you’re at it, don’t forget to put a check next to Bert Blyleven’s name, too. Curt Schilling spent eight years as a member of the Philadelphia Phillies (1993-2000), and it was as a pitcher for this team that he showed the first signs of greatness. For a Philadelphia Enquirer writer’s take on why Schill belongs in the Hall of Fame, click here.